Things that are added to something else to make it look prettier. 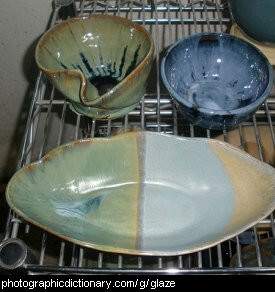 Something is there for decoration if it is there to look good, or to make the thing it is attached to look good. 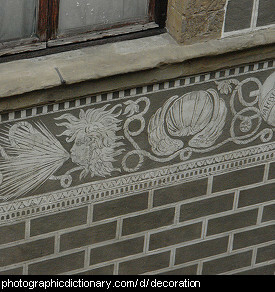 The picture is of some decorative trim on a building. A frill is a type of trim around the edge of something to make it look prettier. A frill is usually gathered on one edge and free on the other, forming a ruffle. A fringe is a decoration along the edge of something. 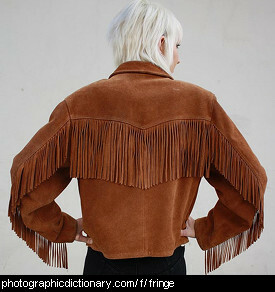 Fringes can be fine threads, strips of leather or even a row of tassels. Fringe can also be used to simply describe something on the edge or outskirts of something else. 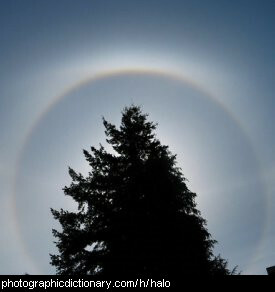 A halo is a ring of light around something. Religious figures and angels are often drawn with a halo around their heads. Inlaying is a decorative technique, where some of a surface is cut out and filled in with another material so that the surface of the inlay is the same height as the original surface. 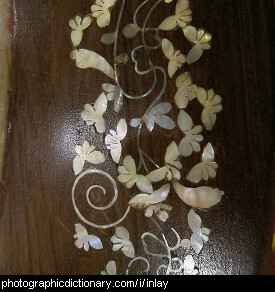 Usually the inlay material is brightly colored, a shiny metal, or a pretty material such as mother of pearl. The surface being inlaid is most commonly wood, and inlay work is commonly seen on furniture in some countries. Metal jewelry can be inlaid with gemstones or contrasting metal. A tassel is a bundle of threads tied together so it looks nice. Tassels are usually made of silken threads, so they are shiny. 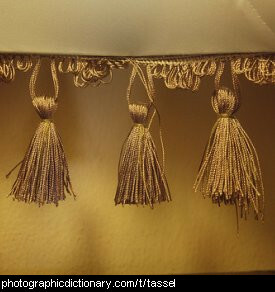 Tassels can often be found on the bottom of curtains, or on the edges of cushions. Trim might mean: Some kind of decoration, particularly around the edge of something, or To tidy up or remove the excess from something, particularly around the edges, for example trimming a hedge. 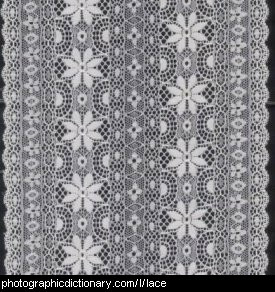 The girl in the photo is wearing a top with lace trim.